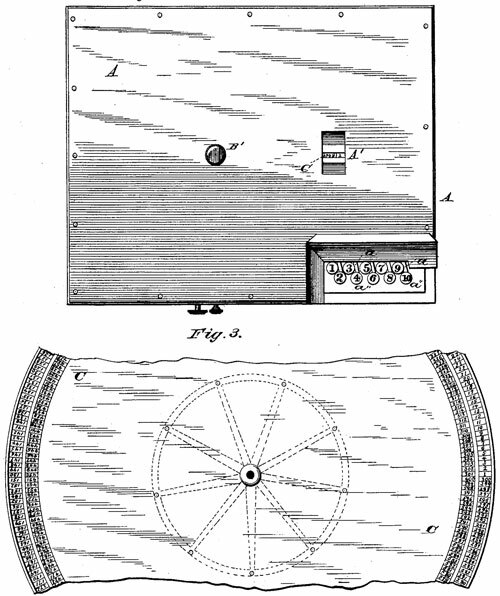 In May, 1882, Mary E. Winter of Galesburg, and Cushman W. Crary of Chicago (assignor to Mary Winter), patented a keyboard adding machine. Interestingly, one of the early keyboard calculating machines in US and the world was also invented by an American woman, who's surname was also Winter (see the machine of Caroline Winter). Suppose the number 300 to be exposed at the slot A', and the number 5 to be the first number in a column to be added; by striking the key 5 the dial will be rotated to bring the figure 5 thereon exposed at the opening A'. Then suppose the number 6 to be the next number in the column to be added; by striking the key 6 the dial will be moved to expose the number 11 at the opening A', which number 11 represents the sum of 6 added to 5; and thus the addition may be continued on the outer series of figures on the dial until the number 300 is reached, when the addition may be continued on the inner series until the number 600 is reached. Whenever a column of numbers are added, and it is desired to commence a new column, the detent-pawl K may be disengaged from the ratchet-wheel by pressing on the lifter L, and the spring P be allowed to rotate the ratchet-wheel in the direction shown by the dotted-line arrow until the stop N' comes in contact with the detent M and arrests the rotation, with the dial-plate in the position hereinbefore described, and in position to commence adding a new column of numbers. It will be seen that an index or pointer, instead of a dial-plate, may be arranged to rotate with the ratchet-wheel, and a fixed dial-plate be used therewith, and also that a brake may be attached to the detent-pawl K, as shown by dotted lines at the rear end of the pawl K, which brake will come in contact with the ratchet-wheel when the pawl is turned to release it, and thus prevent a too rapid motion of the ratchet-wheel from the action of the spring P.
Nothing is known about Mary E. Winter of Galesburg, but there is some info about Cushman W. Crary. Cushman Walker Crary was born on 12 August, 1822, in Potsdam, St. Lawrence County, New York. He was the son of Elias Crary (1795-1876) and Abigail Walker (1796-1861) of Vermont. On 3 July, 1846, in Kane County, Illinois, Cushman Crary married to Hannah Rowena Nichols (1824-1875). They had 3 children: Lewis Joshua (1847-1915), Marietta Emily (1851-1942), and Hamilton (b. 1853). After the death of Hannah in 1875, Cushman married to Caroline Cass (1836-1907). Besides the above-mentioned patent for adding machine, Cushman Walker Crary was a holder of 3 other US patents: US282059 for gear cutter, US299964 for chuck, and US334073 for electric-arc light. Cushman Crary died on 21 April, 1914, in Chicago, Illinois.